The Marvel Cinematic Universe has been on a serious roll in Phase Three, as every new blockbuster has been met with critical and box office success. The last decade of filmmaking will come to a head when Avengers: Endgame arrives in a matter of days, picking up the narrative from the shocking ending of Infinity War. The Russo Brothers broke fans hearts by wiping out half of all life, as moviegoers watched countless fan favorite characters fade to dust. Well, this is wild. Bruce Banner/Hulk has been in every Avengers movie, so it’s hard to imagine Endgame without the big green guy. But it looks like that was on the table for a while, as The Russo Brothers had Mark Ruffalo film a dusting scene of his very own. Mark Ruffalo’s comments to Yahoo are sure to puzzle cinephiles, given how Infinity War and Endgame were filmed directly after each other. As such, Hulk’s fate presumably was only a question for a limited time. Because The Russo Brothers had the scheduling nightmare of working out shooting for Endgame, and would need Ruffalo to clear up his schedule in order to play Banner/Hulk alongside the rest of the living heroes. The ending of Avengers: Infinity War was truly devastating, as the fandom didn’t expect Thanos to win and exterminate so many iconic characters. And it seems The Russo Brothers experimented a bit with who would be a victim of the snap, and fade to dust before our eyes. Instead of merely being phased into a rock in the Hulkbuster armor, Bruce Banner could have also faded to dust from within the suit. And with that ending, Hulk wouldn’t have gotten another chance to face off against the Mad Titan. Luckily, Bruce Banner survived the snap, and should have a meaty role alongside the rest of the survivors when Avengers: Endgame finally hits theaters. 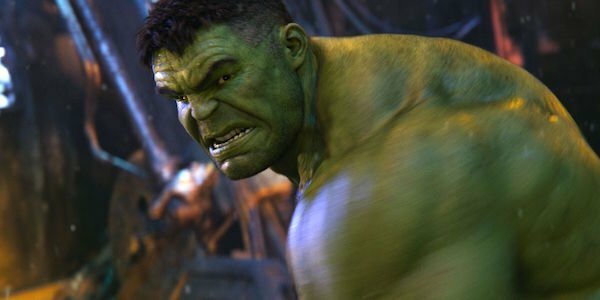 Fans are especially eager to see Hulk return to the screen, as he was largely absent in Infinity War after losing a fight in the film’s opening scene. As a reminder, you can check out that scuffle below. Merchandise from Avengers: Endgame hints at a rematch for these two powerful characters, so it’s a good thing that Hulk wasn’t dusted during The Snap. It’s also poetic to see the original team reunited in the upcoming blockbuster, allowing The Russo Brothers to end the narrative that started back with Iron Man in 2007. Answers will come when Avengers: Endgame arrives in theaters on April 26th. In the meantime, check out our 2019 release list to plan your next trip to the movies.